Tired of Thanksgiving leftovers? Here’s an idea to make them more interesting, layered salad-style. 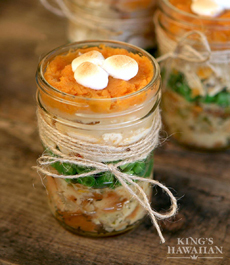 Make a fun lunch by layering Thanksgiving leftovers in your mason jars. We adapted this recipe from one created by Neens for Kings Hawaiian, our family’s favorite supermarket bread. If you’re out of any of the ingredients, substitute something else or omit it entirely. Prep time is 20 minutes, optional cook time is 10 minutes (or 1-2 minutes in the microwave). Leftovers get a new look (photo courtesy Kings Hawaiian). 2. LAYER the ingredients in this order: stuffing, cranberry sauce, green beans, turkey, gravy, yams. 3. TOP with marshmallows and bake until the marshmallows are browned. Let the jars cool enough to hold. Here’s a recipe to make stuffing from a mix of King’s Hawaiian and cornbread.